Plans to expand Addo into a 264 000 hectare (652 300 acre) mega-park which includes proclamation of a 120 000 hectare (296 500 acre) marine protected area, which will include islands that are home to the world's largest breeding populations of Cape gannets and the largest breeding population of the endangered African penguin. After a morning game drive in Addo, we make our way to the Mountain Zebra National Park near Cradock. The craggy heights of the Mountain Zebra National Park's Bankberg with rolling plains and deep valleys, and have become a preserve for the Cape mountain zebra. The proclamation of the park in 1937 saved these animals from extinction, and currently their population stands at 300. Other mammals found here include cheetah, Cape buffalo, black rhino, eland, black wildebeest, red hartebeest and gemsbok, while mountain reedbuck and grey rhebok frequent the higher areas. Caracal occupy the niche of primary predator. 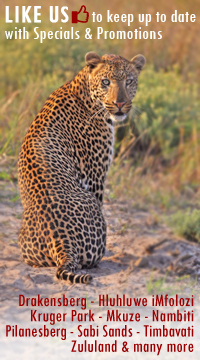 Spend the day game viewing - game drives will be conducted by your guide in his vehicle. Today we leave Craddock en route through the Karoo to the Karoo National Park near Beaufort West. The Great Karoo is a vast and unforgiving landscape of which the Karoo National Park is but a small portion. Being the largest ecosystem in South Africa, the Karoo is home to a fascinating diversity of life, all having adapted to survive in these harsh conditions. Karoo National Park is dominated by the lofty Nuweveld Mountains and rolling plains, where many species that originally occurred here now once again occupy their former ranges. The Karoo National Park has a wide variety of endemic wildlife. Many species have been relocated to their former ranges - such as brown hyena, lion and Cape mountain zebra. . This morning we make our way to Oudtshoorn where we overnight at the Turnberry Boutique Hotel (or similar). The Turnberry Boutique Hotel is situated in the centre of the picturesque Klein Karoo town of Oudtshoorn. A warm welcome, awaits visitors to this tiny piece of Scotland set in the heart of the Klein Karoo. Relax in the comfort of one of the well appointed air-conditioned bedrooms (each with satellite television, a coffee station and a mini bar), all with en-suite bathrooms, and cosy double beds fitted with crisp white linen. Each room also has wireless Internet connection. Today we visit the Cango Caves near Oudtshoorn, which are among the biggest stalagmite formations in the world. Some of the sandstone formations are colourfully illuminated. The intriguing shapes in the caves are composed primarily of calcium carbonate. They develop as limewater drips and evaporate leaving a residue. The structures growing down from the cave ceiling are called stalactites, while those that grow from the ground to the top are called stalagmites. Visit a working ostrich farm where one can learn more about these the birds and the feather industry. Commercial ostrich farming started during the late 1880's in South Africa.The fashion demand in Europe for ostrich feathers inspired the growth of the industry, with the Oudtshoorn district quickly being established as the "ostrich capital of the world". During the first decade of the previous century, ostrich feathers gained record prices on foreign markets, ranking 4th on the list of South African exports, after gold, diamonds and wool. The consequence of this newly found opulence meant that ostrich farmers were able to build beautiful sandstone mansions. A unique feature of the farm experience is a visit to one of these, the Ostrich Palace "Welgeluk" which was built at the height of the feather boom in 1910. The homestead is a National Monument and a superb example of the type of architecture of that era. Safari Ostrich Show Farm was established more than 40 years ago. Lunch will be enjoyed at this farm. After breakfast we drive the Swartberg Pass, considered one of the most impressive mountain passes in the world - an untarred road that winds to the summit 1583 meters above sea level with scenic views all the way. The road is reinforced in places with hand-packed stone walls, a characteristic of Thomas Charles Bain's design, a brilliant road engineer of the 19th Century. En route are relics of prisons, tollhouses, and Way stations that bear historic testimony to the past. Often covered with snow in winter, the mountain's microclimate supports fynbos and a rich bird life, in contrast with the arid-zone flora and fauna outside its cool shady kloofs. The Swartberg Pass was declared a National Monument in its Centenary year, 1988. Lunch stop at the town of Prince Albert, then on to Meiringspoort, a deep ravine through the seemingly impenetrable Swartberg Mountain range. This natural passage forms a convenient link between the Great and Little Karoo. Soaring cliff walls with spectacular rock formations line the 25 km tarred road, which winds along the floor of the gorge, crossing the Groot River 25 times. Please note that this trip is only possible if the Swartberg pass has not been closed. This usually happens when there has been heavy snowfall or very heavy rain, making the road dangerous. From here we will make our way to Knysna, where we overnight at the Knysna Hollow (or similar). The garden chalets and rooms are set in lush gardens and have been tastefully decorated with a Knysna forest feel. Room amenities include televisions, tea and coffee making facilities and private patios. The remainder of the day you are at leisure. After breakfast we make our way to the Featherbed Reserve. This spectacular four-hour eco-experience includes a return ferry, walk and lunch and a 25-minute ferry trip on the Knysna Lagoon to the Western head (The Reserve is only accessible by ferry.) Upon arrival, guests board a Unimog drawn trailer and drive up to the top of the Reserve. While stopping at a scenic lookout point, our specialist guides will share with you some fascinating tales about Knysna and the surrounding area while you enjoy the panoramic views. An optional 2,2 km guided nature walk takes you through the forest, onto the cliffs, into the caves and along the scenic coast. Once back in the Food Forest, a unique outdoor restaurant situated under the Milkwood Trees, guests can enjoy a spectacular 12 dish buffet lunch. From Knysna we make our way to Mossel Bay where we visit the interesting Diaz Museum in the town. This building was originally erected in 1901 to serve as a grain and sawmill. It was adapted to serve as a unique Maritime Museum and houses, the impressive life-size replica of Bartholomew Diaz's caravel, the ship in which he sailed into Mossel Bay in the year 1488. It also displays ship models of a bygone era, route maps to the East and exploration of the Dark Continent in general, as well as the Post Office Tree, the Granary and a Shell Museum. Beaches and sunshine, the clean Indian Ocean and the Outeniqua Mountains green and purple in the distance - this is what Mossel Bay is about - a gentle seaside town on the Garden Route of the Western Cape Province of South Africa. This morning we make our way to Cape Town. If this is during the whale season (July to November) we may travel via Hermanus, which is built along the shores of Walker Bay near the Southern most tip of Africa. Magnificent mountains watch over the town which is home of the Southern Right Whale. Nature lovers from all over the world visit Hermanus to view these magnificent creatures from the best land based whale-watching destination in the world. We drop you off at your overnight destination in Cape Town or at the Cape Town International Airport.